Poor Brian is sick – isn’t he pitiful? All I got when I took this picture was a mumbled “hey” in protest. He started out with a headache and fever on Sat. evening. He recouped well yesterday and thought he’d be back at work this morning, even to the point of getting into part of his uniform. 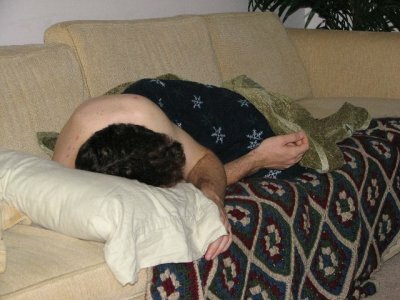 But after breakfast he was back down and by 9:30 moved from the recliner to the bedroom. I woke up at 3:00am with a bad sore throat but later got up at 5:30 and ran three miles, hoping it would make me feel better. It worked for a while but I’m steadily feeling worse….I think I might go creep into bed with Brian. We would appreciate it if you would lift us up in prayer.